Head on down to Coney Island for a full day of fun, adventure, celebrations, and fireworks to commemorate the birth of America this Independence Day. 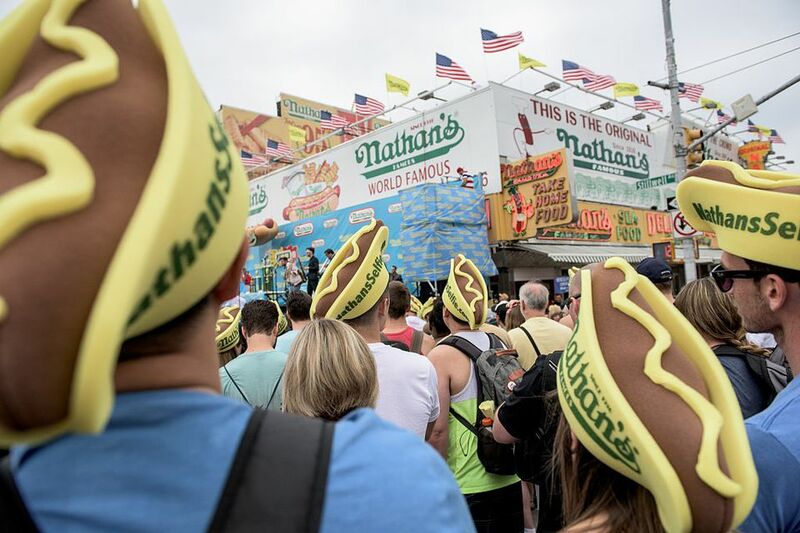 From the traditional Nathan's Hot Dog Eating Contest to a baseball game featuring the local Brooklyn Cyclones, there's something for everyone. With easy subway access, plenty to do, and a lot of big events planned throughout the day on July 4, you won't be bored in Brooklyn. As many as 120,000 people can flock to the Coney Island beach on a hot day, and July 4th is usually pretty darn hot. Start your Independence Day holiday with some early sunbathing by arriving before 9:30 a.m., but don't swim until the lifeguards arrive to start their shifts at 10 a.m.
Take a break at 11:30 a.m. and head over to Nathan's Hot Dog Eating Contest, where you can wave at the TV cameras while you watch some of the top competitive eaters in the world compete in this time-honored tradition. The contest will be broadcast live on ESPN, so you could also head to a nearby bar and grab a beverage instead of fighting the crowd. After watching the contest, if you haven't lost your appetite forever, grab a hot dog for yourself at Nathan's famous flagship location. For a break from the midday sun and throngs of people enjoying all that Coney Island has to offer, head over to the NY Aquarium to watch the fun world of fishes, penguins, sharks, and other sea life. The NY Aquarium often offers discounts on holidays, but be prepared to face longer lines and bigger crowds due to the popularity of Coney Island on Independence Day. Once you're finished hanging with the aquatic life at the Aquarium, walk back down the boardwalk to Coney Island USA for a hilarious, only-in-Brooklyn sideshow. This 45-minute production includes outrageous, weird spectacles, circus performers, and even the world-famous bearded lady (if you're lucky—she also has tenure at Pratt Institute in Brooklyn). It's billed as "the last permanently housed place in the USA where you can experience the thrill of a traditional ten-in-one circus sideshow. They're here, they're real and they're alive! Freaks, wonders ​and human curiosities!" You cannot pre-order tickets to the show, but productions run every hour between 1 and 8 p.m. There's plenty of stuff to see and delectable treats to enjoy all along the boardwalk—especially during the summer. So once you've enjoyed the freak show, stroll on the boardwalk and grab some treats at the historic ​Williams Candy Shop on Surf Avenue. For a sobering moment, visit the MCU Stadium's moving Wall of Remembrance, dedicated to the fallen of September 11, 2001, which is free and open to the public. On July 4 the Brooklyn Cyclones will play a baseball game against the Aberdeen IronBirds. Enjoy a kosher hot dog, giant pretzel, or a chicken wrap from the kiosks at the far edge of the stadium. Alternatively, if you don't have a ticket to the game, spend a few hours at Coney Island's amusement park where you can ride the Cyclone, take the kiddies to Luna Park, or scream your heart out on thrill rides in the "Scream Zone." Although the Coney Island Amusement Park and the Boardwalk have suffered fire damage multiple times throughout their history, this historic site has mostly been in operation for the last 100 years. For dinner, you can buy some more fast food, take the 30-minute boardwalk walk over to Brighton Beach for some borscht, or sit in a sidewalk cafe and sip a vodka in this festive seaside neighborhood. If you're running late, either grab it to go or hurry on over to the boardwalk for the 9 p.m. fireworks display, which might not be as long or big as the Macy's Independence Day Fireworks over Manhattan, but it's still worth viewing. Are You Interested in Watching Adults Stuff Their Faces With Hotdogs?